While bassinets have been around for a long time, many parents remain reluctant to invest in one. Bassinets can have a lot of advantages, but one of the big drawbacks to using this style of a baby sleeper is that they can have pretty short lifespans. Babies will, after all, often outgrow their bassinets after a few short months. 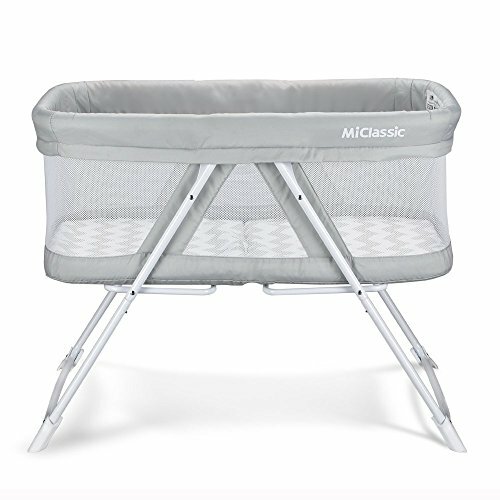 With their 2-in-1 Rocking and Travel Bassinet, MiClassic is making their pitch for the best bassinet design on the market today. This multi-functional bassinet will surely make parents and babies around the world fall in love with its amazing features. As a 2-in-1 style product, it is packed full of useful features that your baby can enjoy for longer. In this review, we’ll evaluate all of these features in hopes to help you determine if this is the best bassinet for you and your baby. While it may have a lot of built-in features, at its heart, this product is a bassinet. If you’ve never heard this term before, a bassinet is like a crib but much smaller. This means that it is well suited for the early months of a baby’s life. It can be slotted into even very small bedrooms so that newborns can sleep as close to their parents as possible. This product, by way of its multi-functional design, is intended to be easily transported. To achieve this, it was made so that it can be folded up quickly and easily. At the same time, it is still a very well-designed product with a lot of features that make it an outstanding bassinet. Because of its multifunctional design, this 2-in-1 bassinet would appeal to someone who is looking for better value in their bassinet investment. Since it folds up for easier transport, it could also be extremely useful for people who may need a bed for their baby while they travel to multiple locations. For example, if you and the baby stay with grandparents once or twice a week, it could be handy to have a bed that folds up and comes with you. The product is delivered boxed and requires some very little assembly. In reality, it is quite straightforward, which means there’s nothing to worry about. As ever, it is a good idea to read the included manuals thoroughly before you use the product. The folding design is, of course, the headline feature of this bassinet and, frankly, that is rather fair. The fact that it folds up in seconds does make it easy to transport or store, and that, in turn, helps make this design stand out from the crowd. Then again, that is only a good design feature if the bassinet is well-designed. After all, you don’t want to be transporting a poor-quality bassinet around with you all the time, right? Luckily, that isn’t an issue here, especially since the product boasts a lot of the features that you would expect in a well-designed, high-quality bassinet. The sidewall is almost entirely made out of mesh, which is a feature we really like to see in bassinets. Why? That is because it makes for a product that is extremely breathable, and even if your baby rolls toward one edge, their breathing won’t be impinged by the sidewall at all. This bassinet also boasts a built-in rocking feature. It can be unlocked to rock gently, then securely locked into place once the baby has drifted off to sleep. We like any bassinet with a rocking action since it is a time-honored method of getting young ones off to sleep. It goes without saying that the early months of a baby’s life can see them at their most vulnerable. There is a wide array of advice pertaining to the safe sleeping arrangements for newborns, and it is always a good idea to acquaint yourself with this before using a bassinet or a crib. It is also worth remembering that bassinets are designed only for the baby’s first few months. The maximum user weight for this product is 33 pounds. Once the baby is able to sit up or roll over by himself, though, then you will know that it is time to move them to the additional security of a crib, which is designed for slightly older children than a bassinet. While this product is easy to transport from one place to another, it is not really designed for temporary use anywhere. For instance, it would be hard to have it set up in the park if you want to give your little one a few hours in the sunshine. For that, we would suggest looking at the Fold N’ Go Travel Bassinet by Brica. While it is not suited for overnight sleep, this bassinet is very easy to pack up and carry. It can provide a safe and comfortable, if very temporary, bed for your baby when you are out and about. To be honest, we really liked how MiClassic designed and developed this bassinet. After all, when it is in place, it has all the features that you would like to see in a well-designed bassinet. More than that, though, the fact that it is so easy to fold up and transport make it the perfect bassinet for babies who may not be sleeping in the same house or room every night of the week. It is an intelligently-designed product that brings a true air of value. With this , you can rest assured that your baby’s first months are as comfortable and enjoyable as possible. Best Playard with Bassinet: Which Is the Best One for Your Baby? How Long Can You Use a Bassinet? Bassinet to Crib: When Is Baby Too Big for Bassinet? Some recommended products may use affiliate links. CribAndCradles.com is a participant in the Amazon Services LLC Associates Program, an affiliate advertising program designed to provide a means for sites to earn advertising fees by advertising and linking to Amazon.com. Amazon and the Amazon logo are trademarks of Amazon.com, Inc or its affiliates. Copyright © 2018 Crib and Cradles | All Rights Reserved.